The talking head of former Chief Justice Marshall reminded the justices that only by working together as a team on this mission could they avoid a divisive 5-4 split decision. WASHINGTON—Springing into action the moment their SCOTUS wristwatch transponders signaled the alert, all nine members of the U.S. Supreme Court reportedly gathered in their top-secret subterranean chambers Friday to receive their latest directive from the giant holographic head of former Chief Justice John Marshall. After racing into the Supreme Court Building and seating themselves on the bench in order of seniority, current Chief Justice John Roberts and his eight associate justices are said to have raised their right hands and exclaimed, “We, the Guardians of Liberty!” Then, sources said, a lever activated by pulling down the scales on a marble statue of Lady Justice dropped them into nine separate chutes, through which they slid down toward the high-tech underground command center where the disembodied face of the early 19th-century jurist briefs them on new missions. Marshall reportedly summoned the justices at 8:38 p.m., forcing many to abandon their grocery shopping, trips to the opera, and scouting missions high above the D.C. skyline, which they regularly patrol in the Habeas Copter. According to sources, Justice Alito hurriedly pulled on his black robe, turned to the beautiful Swiss model lying in the bed of his Alpine château, and said, “I’m sorry, justice has called.” Meanwhile, Justice Ginsburg, who was spotted shooting pool at the Foggy Bottom Roadhouse, was said by witnesses to have sunk her last shot, grabbed a large pile of bills off the table’s rail, and thanked a group of scowling gang members for their generosity before hopping on her Kawasaki Ninja EX300 and tearing off down Constitution Avenue. Speaking on condition of anonymity, several Supreme Court clerks told reporters their bosses are routinely summoned by the projection of the nation’s longest-serving chief justice, who is now in his third century of contacting court members, often in the middle of the night, to handle juridical emergencies relating to matters such as contract law, commercial litigation, patent disputes, arbitration agreements, and more. “May the powers of Article III watch over you all,” Marshall added before his hologram burst into smoke and the chamber filled with light. Sources confirmed the Supreme Court’s robotic clerk, Amicus, then stumbled into the room with a rickety cart of case files, prompting the justices to roll their eyes. The hapless automaton exclaimed, “Oh, heavens!” and knocked to the floor hundreds of pages of applicable documents from United States v. Lopez, Wickard v. Filburn, and the Agriculture Adjustment Act of 1938. 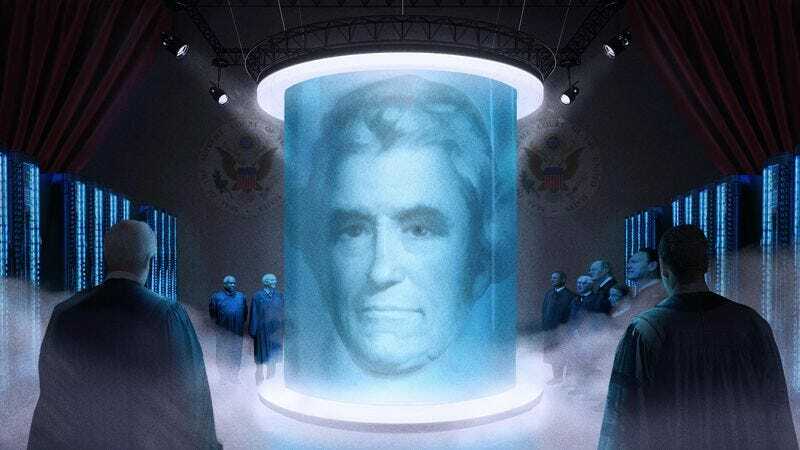 Having received their briefing, the highest-ranking members of the federal judiciary spent a few moments inside the Certiorari Pod—a glowing, neon-green capsule that allows the justices to communicate telepathically, debating the merits of a case at light speed—and then assembled on a round elevator platform emblazoned with the seal of the Supreme Court. “Equal justice under the law!” the jurists shouted as they joined their gavels together in a triumphant salute and then slammed them down in unison. At press time, officials confirmed the Supreme Court had declined to render a verdict on the case, sending the decision back down to the Fourth Circuit for further consideration.